The Building – One Bedford Condos at 1 Bedford Rd. 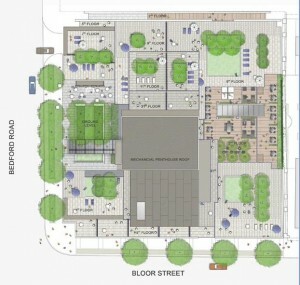 Lanterra Developments has once again astonished Toronto with a fantastic new Condominium to mark Toronto’s skyline. Designed by architect Bruce Kuwabara, one of Canada’s leading architectural practitioners, One Bedford is a magnificent 32 storey structure of glass, limestone, and pre-cast steel. The interior was designed by Munge Leung design associates, whose mission is to create “timeless” rather than “trendy” designs, resulting in a calm and soothing home-like environment. Situated at the corner of Bedford Road and Bloor Street, the One Bedford tower occupies the southern end of the culturally-rich and intellectually-refined neighborhood of the Annex. Just across the street from One Bedford on Bloor Street are some of Canada’s most important cultural monuments: the Royal Ontario Museum, the Royal Conservatory of Music and the luscious park-like campus of the University of Toronto. Also nearby are the Bata and Gardiner museums. One Bedford provides spectacular views of the city: the University of Toronto’s luscious quads, the lofty towers of the Financial District, and the leafy streets and pleasant homes of the Annex and Yorkville neighbourhoods. Living at One Bedford means direct access to Toronto’s most prestigious museums and the city’s premium shops, cafes, restaurants and hotels. Residents also have access to the St. George subway station, connecting One Bedford to the rest of the city. Living at One Bedford means culture, convenience, and class.